Tel Aviv Port. Early ’80s. Long before all the big chains and malls took over the country, there were people who just loved barbecue for themselves, in family gatherings or while meeting friends. They’d buy their favorite meats from their favorite butcher, and they’dprepare it in the best way, as only they knew how: with lots of attention and love, of course. The same principles established so restaurant “Goose” – to do good for the heart, from the heart, with large portions and generous selection of meats range where everyone can find what he likes, a variety of fresh salads and delicious, coming with fresh pitas us a moment out of the oven, Beauty additions that go with meat, fine wines and more. Today, after more than thirty years, you are invited to taste the special flavor of meats outweigh the fire, come with house salads fresh we make here every day and enjoy the atmosphere of joy and the best you’ll find only here, among your friends B”aoozim “. Our famous barbecue meat, with the delicious Shish that, is gently cooked on hot coals. We produce a precise harmony between delicate grilling and premium and high quality meats. Our chefs create a unique, irresistible mix of smells and flavors, which our guests always love! With the success of Tel Aviv Port’s Avazim restaurant, and due to high customer demand, we’ve opened a second branch of Avazim! Our guests can now enjoy our famous quality meat dishes in Rishon Lezion too! Our guests can feel the love we put into each dish. We carefully select each of our meats, and season each dish perfectly using a secret combination of delectable spices (kept in our family for generations!). Finally, we grill each dish exactly to your specifications, making sure our meats are expertly cooked and still tender. Caring for the meat the meat while its grilling- weather its flipping the cut closely monitoring the temperature, or turning the shish at just the right time — gives it the best taste.We creates a famous spice that makes all the meat, whether it’s a fine steak, lamb chops, or chicken, melt in your mouth. Our passion makes our dishes unique you can’t find our delectable meat dishes anywhere else. Are you dying to smell the delicious aromas of our meats on the barbeque? Why don’t you take a look at our menu? Much has been said about the relationship between good meat and alcohol, and to be honest, it’s really obvious. That’s why we keep a wine menu with rich, fine wines. Our guests can enjoy fresh, juicy, expertly prepared meats with quality wine. Our wines are smooth, gentle, and leave pleasant tastes in your mouth. We insist on quality wine selection, both from Israel and abroad, so each diner can relax, and enjoy the pleasant, romantic atmosphere of our restaurant. The success of Avazim at Tel Aviv-Jaffa port has created great interest among our guests from all over the country. Happy customers have repeatedly requested that we open a second location. So, quite naturally, the City of Wines—Rishon Lezion– won the bid to host the second branch of our Avazim restaurant. Our Rishon Lezion branch maintains the high standards of our original location, offering a unique menu of juicy meats, chopped salad with fresh vegetables, and our homemadehummus with slow-cooked mushrooms,eggplant, our famous matbucha, made according to our secret recipe. Experiencing the combination of juicy meat from the grill with our famous homemade salads and our dedicated service will make you feel like royalty. At our new branch, we decided to cater to our guests with strict Kashrut restrictions. Our new location has received an official kosher , and is equipped toserve the religious pubic as well. Our restaurant’s interior design is modern and comfortable, integrating large windows and spectacular views of the nearby lake. In the Rishon Lezion branch of Avazim, we can host and cater your private events, providing dedicated and kind service. Our story began three decades ago in 198x We opened Avazim a small steakhouse located in the Tel Aviv-Jaffa port. Our story began three decades ago in 198x We opened Avazim. a small steakhouse located in the Tel Aviv-Jaffa port. Over time, Avazim has grown and gained momentum. Avazim’s success is due to the high quality of our meats and other ingredients, and our attention to detail. We make sure to grill our meats at just the right temperature and to pair our main courses with perfectly appropriate side dishes and wines. We always provide excellent service and we make sure that our guests have the most pleasant experience possible. For us, it is important that our guests leave our restaurant well-fed and happy. We hope the juicy texture and rich flavor of our meats leaves every guest with the desire to taste more and visit us again and again! Over time, word of the quality of our restaurant spread though Tel Aviv- Jaffa and beyond. Our base of regular, satisfied guests grew. 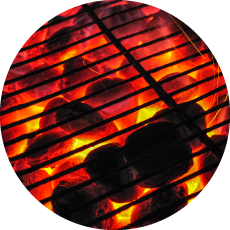 Our guests enjoy quality grilled meat, roasted carefully on hot coals with, the addition of fresh, finely chopped Israeli vegetables, matbucha, hummus and slow-cooked mushrooms,, coleslaw, potato salad, and more! Our passion and love for our work makes Avazim meat delicious. No matter what we’re cooking on the grill – a juicy steak, a premium lamb chop, or tender chicken breast– our chefs handle it with attention and love, providing our guests with the best tastes around. Whether the dish is served on a skewer, in a pita, on a Lapa, or on a plate, we ensure our guests will enjoy their meal. Avazim is the only restaurant in Tel Aviv Port that serves goose liver– a prized delicacy, especially when cooked with our secret family recipe. The highlight of our menu is undoubtedly our famous skewers the largest and juiciest in the city!